SoftEther VPN (from “Software Ethernet”) is a relatively new VPN protocol, a cross-platform multiprotocol VPN, considered the excellent OpenVPN alternative. This post explains what SoftEther is and how you can benefit from its advantages. The SoftEther project was developed as part of a thesis research at the University of Tsukuba, Japan. It consists of two parts: a new VPN (Virtual Private Network) protocol and a VPN server capable of establishing VPN connections using multiple VPN protocols (a.k.a, multiprotocol VPN), including L2TP, SSTP VPN, and OpenVPN. The SoftEther VPN protocol is an alternative to OpenVPN and other VPN protocols. It is free, open source and runs on Windows, Linux, Mac, FreeBSD, and Solaris. Take a look below to see its main benefits. Also, you may read this article for more details. The SoftEther VPN server can communicate with various devices using not only the SoftEther protocol but also L2TP/IPSec or OpenVPN. Moreover, the Microsoft’s SSTP is accepted, even if the VPN server is installed on Linux. By the way, the SoftEther VPN server can be installed on Windows, Linux, FreeBSD, Solaris and Mac OS X. You may read more details regarding the SoftEther server architecture on the SoftEther official web page. Also, you may download SoftEther VPN applications. It is a free and open source. Thus, any potential security flaws can be easily detected and fixed by the community. Due to its SSL-VPN Tunneling on HTTPS, it can “penetrate” highly-restricted firewalls. It is considered to be a StealthVPN protocol. It uses high-level encryption: AES 256-bit and RSA 4096-bit. According to some tests, SoftEther protocol is the fastest. Also, the SoftEther server is faster on all protocols including OpenVPN. The fact that SoftEther VPN server can support multiple protocols is also a big plus compared to OpenVPN. All operating system which supports OpenVPN (e.g., Linux, Mac OS X, Linux, UNIX, iPhone, and Android) can connect to SoftEther VPN server. SoftEther VPN Server has more natural configuration than OpenVPN server. 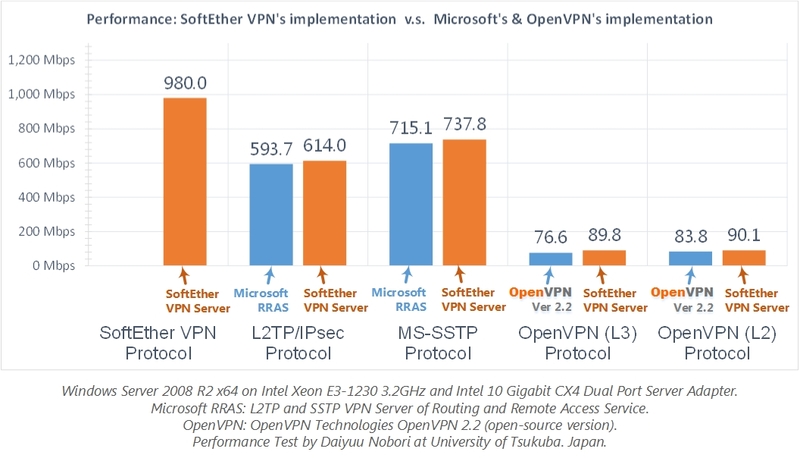 To sum up the comparison, SoftEther is better then OpenVPN in more than one aspect. The future will tell if SoftEther will be adopted on a large scale and replace OpenVPN. The term “SoftEther” is often associated with “VPN Gate.” However, even if the same team develops them, there are significant differences. VPN Gate is an optional extension module that can be activated on a SoftEther VPN Server or Client. According to the project page: If you activate VPN Gate extension on SoftEther Server, then a Virtual Hub “VPNGATE” will be created on your VPN Server. The “VPNGATE” hub contains the “VPN” user with anonymous-attributes. That means that anyone who knows your VPN Server’s IP address can connect to the “VPNGATE” hub on your VPN Server. Also, the module registers your server on the VPNGate directory. Thus, your SoftEther server could be used by anonymous users from all over the World. The “VPN Gate” module is disabled by default for security reasons. Even if the SoftEther protocol is very fast, it has not (yet) been adopted by most of the VPN providers. However, I was able to find a couple of VPN providers that accept connections from SoftEther VPN clients: ibVPN and HideIPVPN. Setting up the SoftEther VPN connections is an easy task. First, you need to install a SoftEther client app. Once installed, create a new VPN connection and fill in the necessary info. Take a look below at the example provided by ibVPN. To sum up, SoftEther looks very promising. The protocol is high-speed, secure and stable. The server side can communicate on different protocols and runs on various server configurations (including Linux and Windows). Keep an eye on SoftEther! It may soon become a VPN standard! What do you think of it? Let us know in the comments below! For me, Softether is much faster than OpenVPN. Unfortunately, not many providers are offering it. I am using with ibvpn at this time and it looks great. I would love seeing it integrated in the windows and macos apps.